SEE the Save The Dakota Bowl Bear Sanctuary Campaign Page For Complete Details on this forest protection campaign. 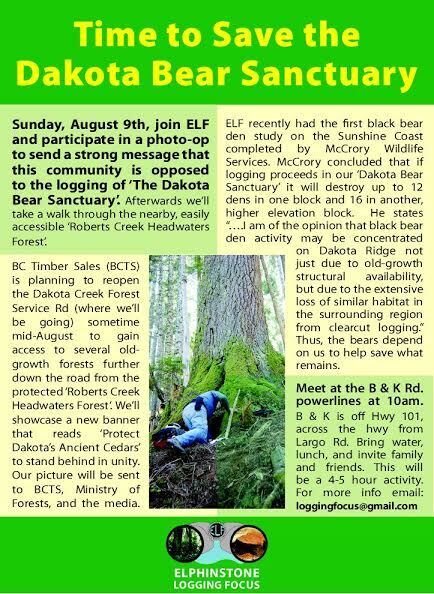 Mark your calendars: Sunday, August 9th to join ELF and participate in a photo-op to send a strong message that this community is opposed to the logging of ‘The Dakota Bowl Bear Sanctuary’. After this we’ll be taking a walk through the nearby (and easily accessible) ‘Roberts Creek Headwaters Forest’. 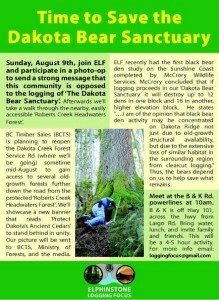 BC Timber Sales (BCTS) is planning to reopen the Dakota Creek Forest Service Rd. (where we’ll be going) sometime mid-August to gain access to several old-growth forests further down the road from the protected ‘Roberts Creek Headwaters Ancient Forest’. We’ll showcase a new banner that reads: “Protect Dakota’s Ancient Cedars’ to stand behind in unison. Our picture will be sent to BCTS, Ministry of Forests, and the media. Thus, the bears depend on us to help save what remains.